A major part of our commitment to improving quality is our pledge to publicly share our performance data and provide clear explanations of what these measures mean. We do this to show our commitment to being transparent to our patients and their families and to support the Patient Centered Medical Home model of care. Testing for Micro albumin: This is a urine test to detect the presence of kidney damage. For optimum health, the American Diabetes Association and the U.S. Department of Health & Human Services, National Heart, Lung, and Blood Institute recommend that Diabetes patients be tested each year. Over an eight month period our office has addressed each and every patient with diabetes, through mailings, phone calls and alerts in their chart. 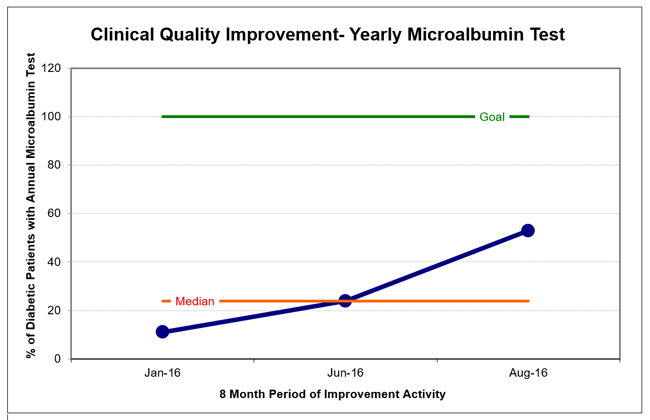 We were able to document an increase in the number of patients receiving this important test from 11% to 53%! Some of our patients see a specialist for their Diabetes and others do not respond to our request for them to be tested. This makes it difficult to achieve 100% documentation, but we will continue to improve! The Centers for Medicare & Medicaid Services require primary care offices to contact 75% of patients within 7 days of an Emergency Department (ED) visit, and within 3 days of a hospital stay. Oldendorf Medical Services staff has worked tirelessly to reach out to patients immediately upon being notified of ED or hospital stays. We rely on receiving timely notification from hospitals when our patients have been there, and also encourage patients to inform us as soon as possible. We are proud to share with you our improvement over the last year, from 64% to 94% of patients contacted within 3 days of a hospital discharge. 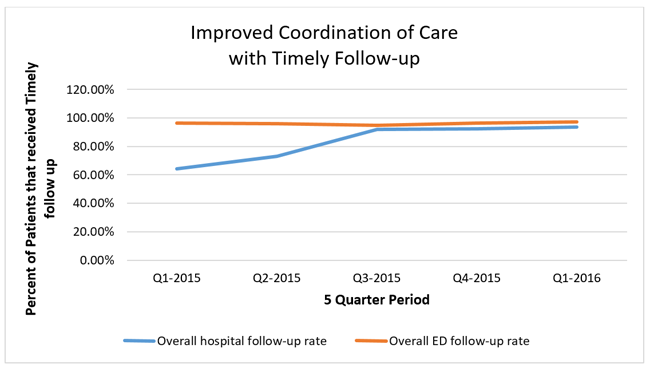 We are also happy to report that our rate of ED patients being contacted within 7 days remains close to 100%! We are happy to inform you that we have shown consistent improvement since 2015 offering “Self-Management Support” to our patients. This means that our staff and providers are helping patients learn how they can better care for their own health issues at home. Helping patients learn to handle day-to-day management of chronic conditions can have a big impact on how they feel and what they are able to do. 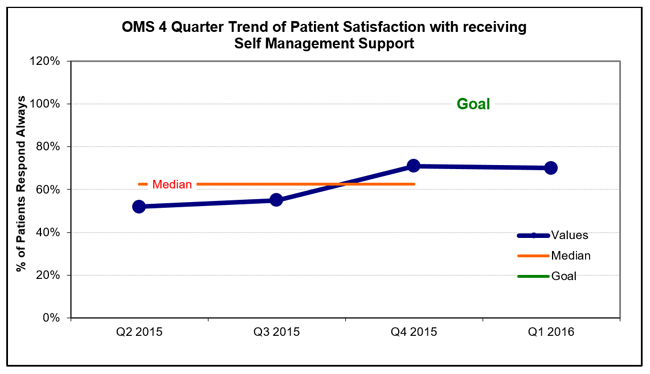 The percentage of patients who feel they are getting self-management support increased from 52% to 71% over a 4 quarter period! Our goal is 100% satisfaction so we will continue to improve these numbers!